Heartache or toothache, which is the worst? I still don’t have an answer for that one. At least for a toothache there is an obvious and effective way to address the source of the pain. Winter is the time I experience the most discomfort and pain with teeth and gums. (And heartache :-(. ), If something is going to go wrong in my mouth, it will, without a doubt, go wrong during the winter months. The one consistent help and comfort has been the oleo-resin from Commiphora Myrrha. Myrrh. It is the only thing that has given me a naturally sourced reprieve from pain and misery of toothache, sore, infected or inflamed gums and loose teeth. Over the years I have found that the essential oil and tincture of Myrrh have done some amazing things for my teeth. (I have had many problems with them). I have had teeth that were so loose I was sure they would simply fall out within hours. Though it seemed obvious it was too late to reverse the damage, a couple of days of diligently swooshing with the salt water Myrrh mix, tightened them back up and saved them for a few more years. Add 1 or 2 ML. of tincture of Myrrh to a salt water “gargle”, (1/4 teaspoon salt to 1 cup of warm water). Swoosh in mouth over gums and teeth as many times as you can or need per day. It works like a charm. 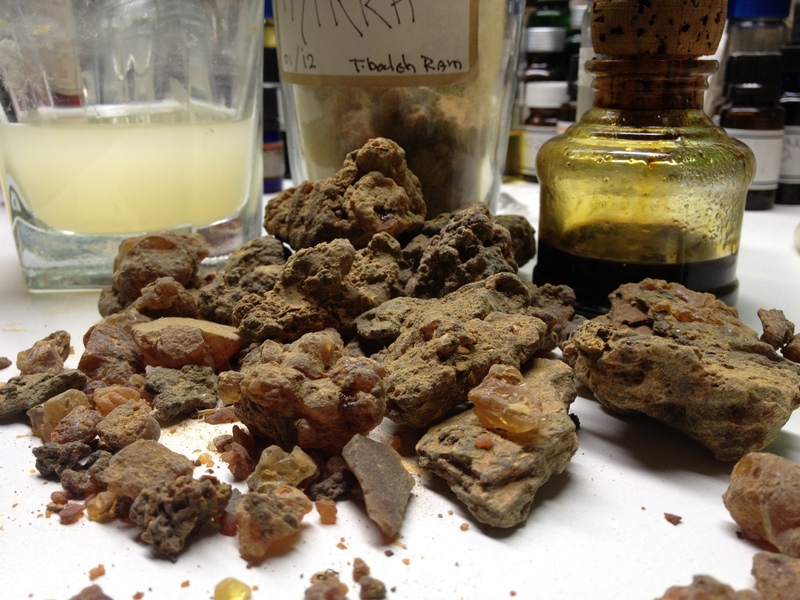 Fresh Myrrh Resin Chunks, essential oil and emulsion of Myrrh tincture with salt water. Also, it doesn’t hurt if you swallow some. The bitter principal in Myrrh is good for you. Especially considering how in our western diet we avoid the bitter principal and flavour as much as possible, and we overdo it with the sweet instead. Some attribute many of our western ills to this imbalance in our diets. Bitter flavours are usually associated with stimulating and toning Liver, spleen or gall bladder. There is simply nothing as effective for healing oral distress than Myrrh. Canker sores, spongy gums, sore, inflamed, infected gums, toothache, (Make sure to get it looked at by a dentist! ), Gingivitis, bad breath, loose teeth, sore throat, post extraction swelling and pain, Denture discomfort, irritation and soreness of any kind. http://www.youtube.com/watch?v=wfBUHwkIXI8 A short video tutorial…. 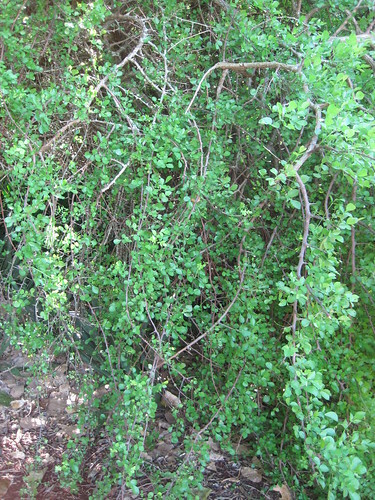 The name Myrrh is rooted in The Aramaic word for bitter. Mar, Mor, Myrrh. Some associate the name Mary, Miriam, Mariam to meaning the bitter of the sea, froth of the sea? (Sometimes associated with the Goddess Astarte, Ashtoreth). Either way a feminine principle which is appropriate since Myrrh is said to be ruled astrologically by the Moon. ( Frankincense by the Sun). There are many more valuable medicinal and spiritual/energetic attributes to Myrrh, but I will leave those for another post. 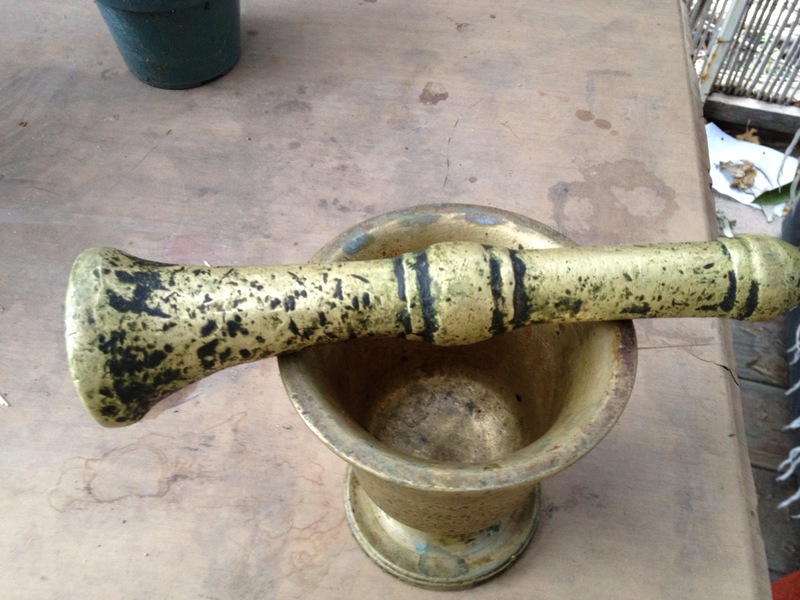 200 year old Brass mortar and pestle. Courtesy Bat Sheva Sharaabi. I have been a bad blog daddy and written nothing here for far too long. Besides my usual travails and struggles through the dark of the sun and dark of the moons that go with it yearly, I have spent too much time (now almost 2 weeks!! ), working on the Frankincense “anti-aging” crème, and trying to write a page about my St. John’s Wort Oil with an introduction to “Astrodynamics”. An attempt that recently led me to realize I must devote a separate post or page to each. Back to the drawing board again! Many many re-writes, but on the bright side, much material from which to draw on for a final draft. The new batch of Frankincense crème is coming along. Smooth, creamy, fragrant and moisturizing beautifully. However, with it have come new challenges and tests. My vision for years has been to create a sublimated product from the whole Frankincense resin. 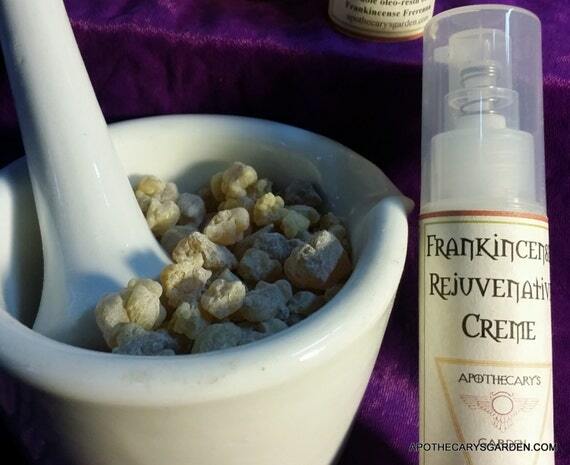 Not just a crème that includes store-bought Frankincense essential oil, anyone can do that. I chose to pursue this first by creating a water/oil emulsion, a lotion, so I could fully utilize the resin, essential oils and the water based gum present in the crude tree sap.. This opened a new set of challenges and can of worms. There are unavoidable consequences and requirements when it comes to supporting the water portion of any emulsion. It must be preserved in some way to keep, and be useful for an extended period of time. As soon as one introduces water into a formula, one has created a perfect petri dish in the equation. There are many life forms competing for dominion over our little Frankincense pool, determined to fulfill their life mandate of self perpetuation and proliferation, that drastic measures are called for. Some of these visitors are benign and simply mar the look of the lotion through time, but some are quite scary and physically dangerous to us higher life forms. My hope was to use the naturally present essential oils and resins to preserve this creme, along with some natural antioxidants and skin nourishing oils that would keep the other oils from rancidity. Many of the healing ingredients in this crème are at the same time, anti-fungal, or anti bacterial, anti microbial, anti-oxidant,or anti viral, but the quantities needed for them to be functional full spectrum preservatives in a water based formula, makes them unsafe on the skin. If I reduce the proportion of water to resins and oils, (using only a very small amount of water to dissolve and incorporate the gum part of the frankincense), I may find a solution, but time is needed to explore this option. No quick answers here. There are some cosmetic cremes on the market that boast having no artificial preservatives, but I don’t know how accurate their claims are. What length of shelf life they offer. Or how they manage this. This too requires more research. ……Time. My apologies to all my Guinea pigs waiting for this lotion here at home and abroad. I will indeed keep and test this water based Frankincense “anti-aging” Creme formula, but it will be with a minute percent of “Liquid Germall Plus” added to it for everyone’s safety until I can perfect a formula which requires no added “artificial” preservatives such as my regular oil/resin formulas. It is easily researched on the web for your own edification, and for those to whom 0.1%-0.5% is an acceptable amount to apply to their skin, I will happily deliver a quantity for their feedback. Meanwhile I have separated gum, or water-soluble parts of some Frankincense and some Myrrh, and will use this pure oil/resin as a base for a water-less “serum”. I will continue working on it, and a lotion version that holds “less water”. Of course, I will let everyone know how they are coming. ,Thank You All for bearing with me!! Call it working outside my comfort zone, exploring new territory, or call it growing pains, stretching my envelope, learning, or all the above really. But in the end, it seems it is I that is being ground to a fine powder by the Frankincense!! How cool is that!!! 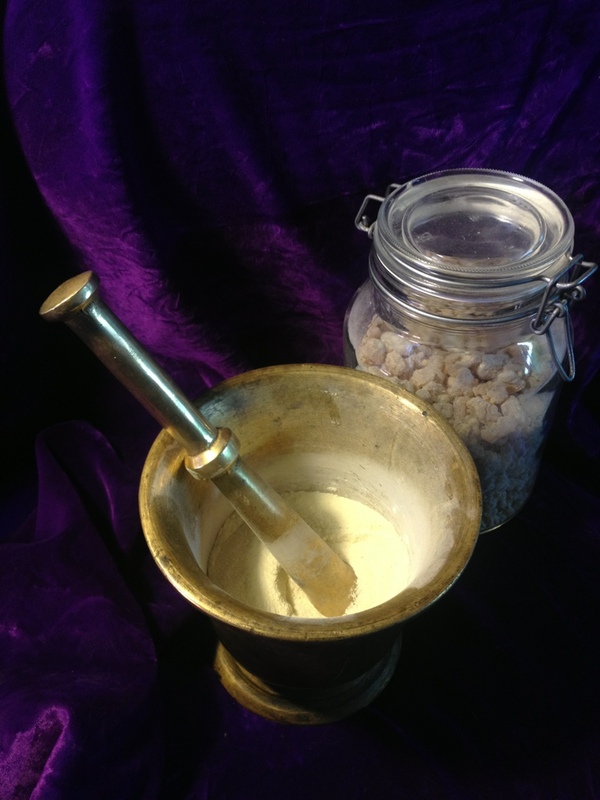 When the Frankincense powder is so fine it starts acting like a liquid, swooshing in waves around the pestle and up the sides of the mortar, that’s when you know it’s ready to blend with the solvent. As if it really really wants to become a liquid, to evolve, and you are just helping out. Nothing is forced. There is a rhythm and poetry to it. Harmony. The symbolism of mortar and pestle is rather obvious on different levels. They “make music” together. I find it meditative, grinding, pounding, stirring connecting grinding just rhythm being and pounding stirring rhythm unfolding here and pounding now and rhythm nothing grinding else stirring matters. The whole of the universe, time and space in my lap. grinding and pounding stirring connecting. Extracting the resin and Boswellic acids from Frankincense. A visual walkthrough. 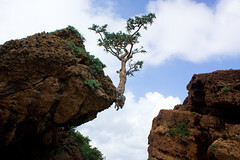 If a Frankincense tree falls, does anyone hear it? A report from the forest. Made from the whole oleoresin of Boswellia Frereana not just the essential oils. 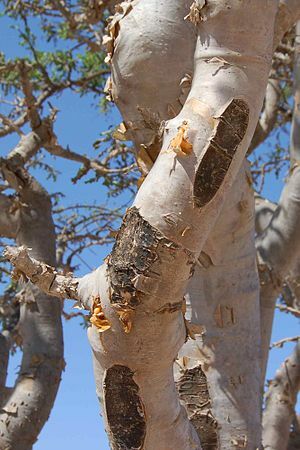 Fresh Somali Myrrh-Commiphora Myrrha." SUHUL" Myrrh is the gift the tree offers without tapping. It is beautiful! The best herb for oral care. In the shop. Abyssinian Twirling Wax -A true classic. and my own daily summer grooming wax. You will find it here in the shop along with a link to my recipe for making your own..
Herbal Apothecary, Wildcrafter, Sculptor, Craftsman. Father, mentor. Owner of Apothecary's Garden and Fairtrade Frankincense LTD. Providing a selection of fresh & fair trade, ethical and sustainably harvested Frankincense and Myrrh species, local and exotic fragrance materials, unusual essential oils, Natural perfume ingredients and animal essences. 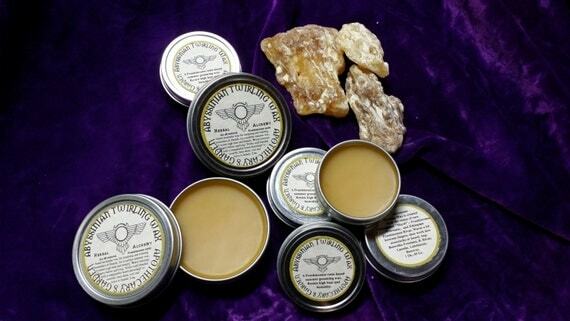 Astrodynamic plant Preparations, Herbal salves, cremes, tinctures and oils. Tested on Animals and Babies, Children, Parents and Old Folks. A sap for resins, ritual, Sun, Moon and Mother Nature. Apothecarysgarden.com is: A journal about Herbs, plants and processes. Recipes, plant Alchemy and our Relationship with Nature. Natural fragrance and medicine. Astrodynamics, rhythms and cycles, Medical Astrology, traditional Wisdom. Herbs and Healing, Science and Spirit. Oh and moustaches. 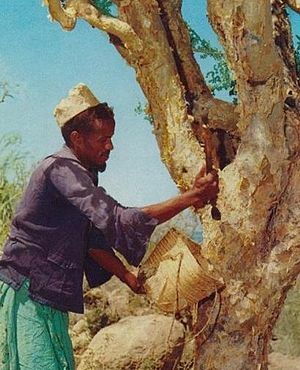 Fairtrade Frankincense explores our ancient and modern relationship with Nature's fragrant, medicinal oleoresins and provides a link joining traditional harvesters directly with our western market in fair and mutually beneficial commerce.